The Quicksilver project was set up to resurrect the design process that created and developed Donald Campbell's legendary boat, Bluebird K7. Campbell had marked-up an unprecedented string of seven consecutive World Water Speed Record triumphs for Britain in the 1950s and 60s, but then came an abrupt ending with his death in 1967. The record passed to America and then Australia, but Britain wasn't entirely beat. Led by Bluebird's chief designer, Ken Norris, we revisited the principles of K7's original design and its subsequent years of evolution, with a specific view to developing a worthy successor. What followed was a long-drawn-out and highly demanding quest to create a new boat. What would be a satisfactory configuration for this new craft? How might future Bluebirds have looked if Donald had lived? Three distinctly different concepts and many more sub-variants were evaluated before we finally settled on the definitive design. No words of gratitude can sufficiently honour the late Ken Norris – pictured above, at centre – for leading this intensive research and design effort throughout a 12-year period of almost constant reassessment and change. Ken had not only co-designed Bluebird K7, but also Campbell's successful Bluebird CN7 World Land Speed Record car – he had little left to prove – and yet in the latter years of his life he had a yearning to understand more fully the lessons of the past and turn them into concepts for the future. He channelled it to a huge devotion of personal time and effort, almost all of which he invested in the Quicksilver project, which simply wouldn't have existed without him. Indeed, the project was built around him. 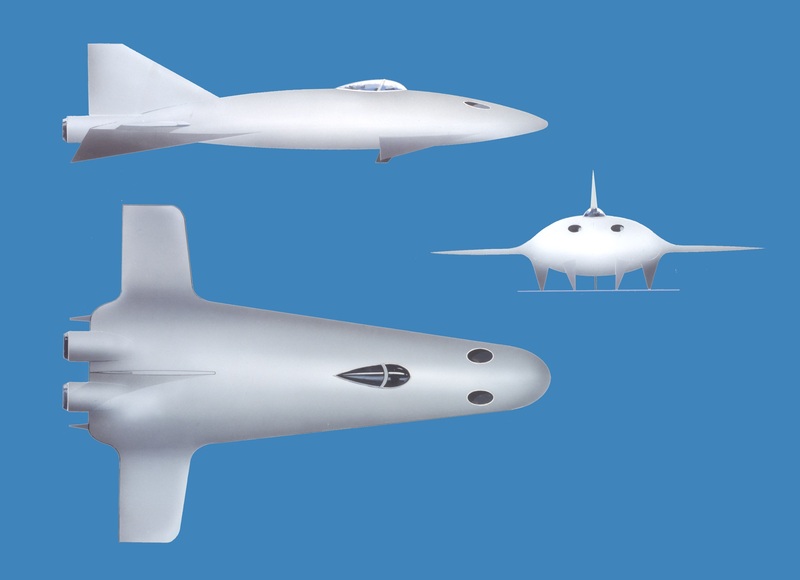 Regarding the three earlier Quicksilver concepts, each described and illustrated below, each one had attributes to recommend it. Any of them might potentially have been successful, given sufficient work. But in the end we graduated to the design we have today – Concept 4 – which embodies the best aspects of its predecessors, combined with some fresh new principles. And tantalisingly, its configuration reflects Norris's thinking towards the end of his time with us, though others played key roles in defining it. We did not intend such a time-consuming and difficult process, with so many different avenues explored. But a protracted period of evolution proved to be the only way of finding what we were searching for. And the experience gained stands us in good stead. Ken Norris's original design concept for Quicksilver was tested in model form in great secrecy. A key feature was that it would have four planing surfaces, whereas before it had been customary for craft in this class to have three. The 'four-pointer' principle was central to Ken's philosophy, and it is a constant throughout Quicksilver's long design history. Another novel aspect of the Concept 1 design is that its inspiration came from a car! The car in question was the Norris Brothers' four-wheel-drive Bluebird CN7, a record-breaker whose shape was designed to place an equal load on all four wheels at speed. The theory was that such a shape lent itself well to an ultra-high-speed boat, as it would be inherently stable in pitch. However, in reality it was found in extensive windtunnel tests to be difficult to achieve the required degree of aerodynamic stability when the theory was applied to a marine vehicle. This, in spite of numerous design modifications. The concept was therefore abandoned after three patchy years of study had been devoted to it. 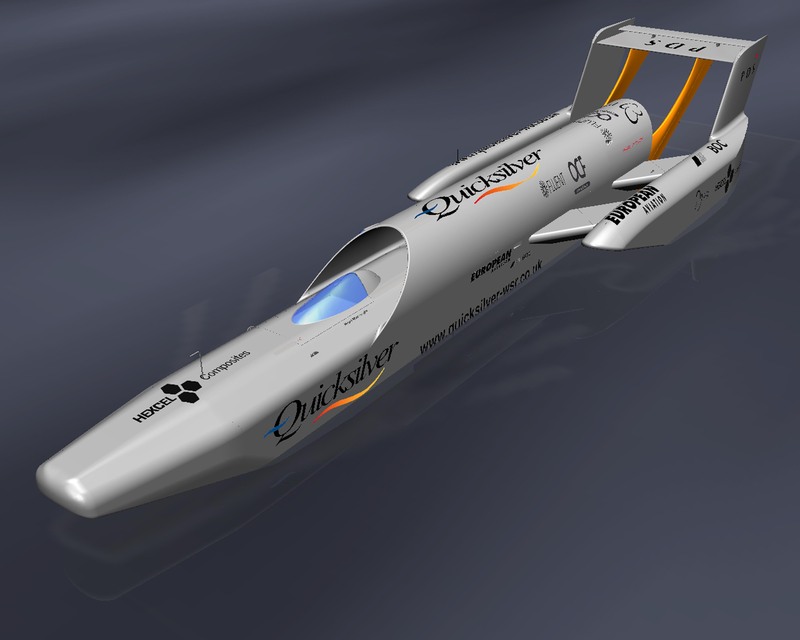 The second Quicksilver concept had only a relatively short period in favour. Ken Norris's approach this time was pragmatic: build a boat almost identical to his very successful Bluebird K7, seven times a world speed-record holder, but this time having four planing surfaces instead of three, and with the sponson layout turned 'back to front'. With the project continuing in strict secrecy, much of the boat's main hull structure was built. The work was carried out by racing-car fabrication specialist Bo Johansson, and a Rolls-Royce Turbomeca Adour turbofan engine was acquired, together with a second Adour earmarked as a spare. But then the decision was taken to terminate construction. A 'four-pointer' like its predecessors, the third concept for Quicksilver occupied a huge amount of time, during which much refinement was made through successive rounds of windtunnel and towing-tank tests. It showed such great potential that finally its shape and basic details of its technical specification were publicly revealed. From that moment on, we shared our project with the world. By this time, the Rolls-Royce Spey Mk.101 turbofan had been selected as its powerplant, and several of these engines had been acquired. Construction got under way a short time later, but only after Ken Norris had been supplanted as chief designer and other designers started becoming involved. With so many fertile minds at work, it was perhaps inevitable that the project would take another direction. 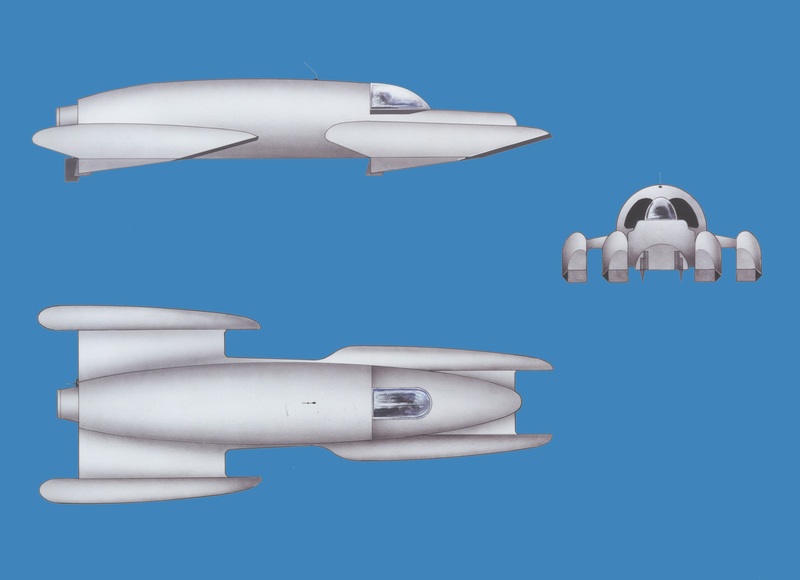 A search began for an even better concept, still incorporating many of Ken's design principles, and it was decided to use the unfinished Concept 3 boat as the basis for it. 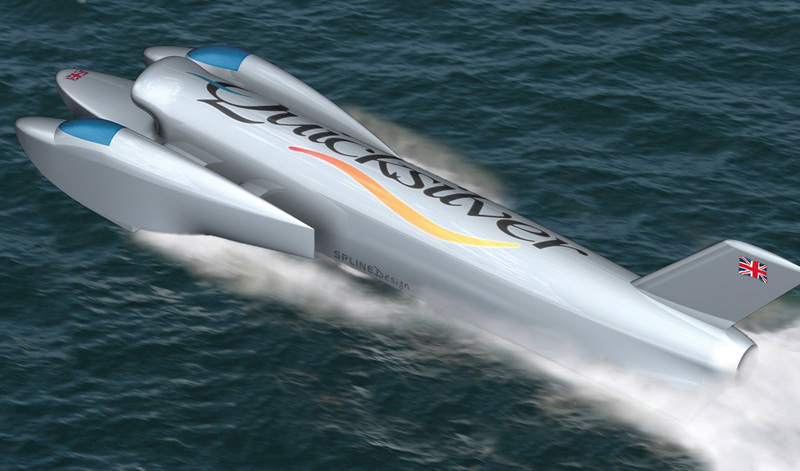 This is the definitive version of Quicksilver – the boat we are building today. Almost all of the hardware that had been built and acquired for the Concept 3 boat is being reused in the construction of Concept 4. The 'four-pointer' arrangement continues, but with the sponsons relocated to the front due to the engine being mounted further forward in the hull than previously. A front-sponsoned layout was a development Ken Norris was considering towards the end of his time as the project's chief designer. There are two cockpits – one in each sponson – as the forward positioning of the engine and improvements to the air-intake design leave insufficient space for a single, central cockpit. Overall, the shaping of the main hull and sponsons is far more complex than before, although the tailfin configuration is quite conventional. While features from Ken Norris's involvement abound, Ron Ayers, Lorne Campbell, Mike Green and Roland Snell all had a hand in defining Concept 4.